This label is constructed with a White smudgeproof face stock and permanent adhesive. Cheshire labels have no vertical or horizontal perforations in the liner. To be put in black bags. 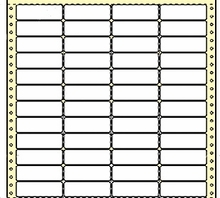 3.2" x .92" Labels, Four across, 1" vertical spacing. Commonly applied with a Cheshire Machine. These labels are fan folded, and packaged 20,000 (20M) labels in a box. Shipping weight is nineteen (19) pounds. Our stock pin feed labels are made from a white smudge proof face stock, with permanent adhesive. They are compatible with all impact printers with a wide carriage, including dot matrix, train printers, chain printers, and bar printers. In stock for Immediate Shipment!